Fun 25mm/1-inch pet themed pin badge. 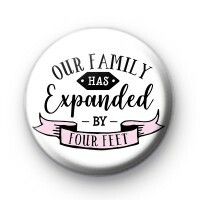 If you've recently added a four-legged friend to your family then this is a super cute badge for you. It is a nice badge for a dog, cat or even horse lovers. Pets are part of the family! We have lots of funny, cute and sassy pet themed badges in the shop so make sure you take a look at those too.